For once, thatis last Thursday, the heat has somewhat abated. We even had welcome rain almost all day long. The Missus and I did not need more encouragement to pay a belated visit to our favourite sushi Restaurant in Shizuoka Cyt, Sushi Ko. We did have a lot I will describe in the next posting but I thought my vegan and vegetarian friends would like to see a separate article about vegan/vegetarian sushi! Mr. Oda seved us 5 different types. 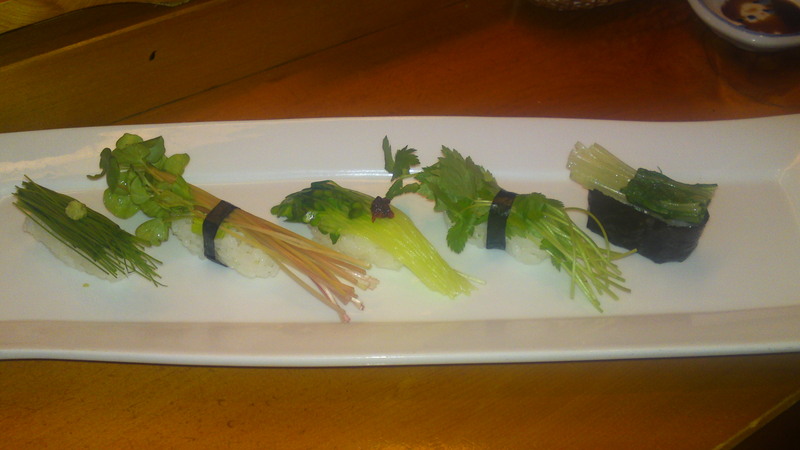 The first two are menegi/芽葱 or thin leeks sprouts topped with a little yuzukoshio paste. 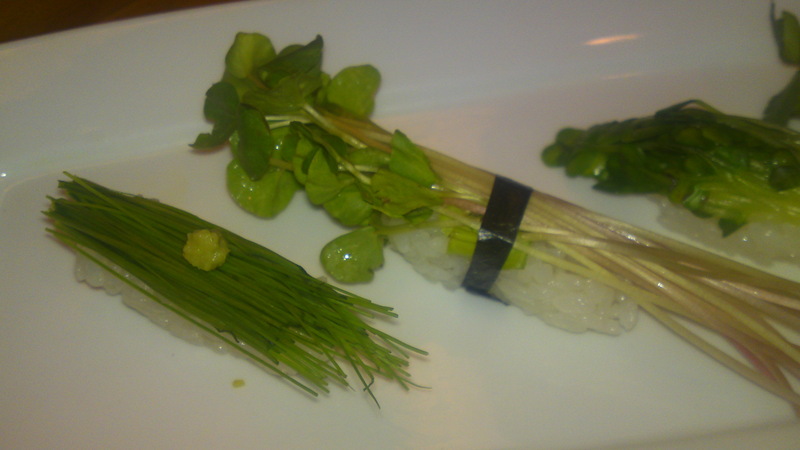 The second one is himesoba/姫蕎麦 or buckwheat sprouts secured with a small band of nori/dry seaweed. The third one was kaiwaredaikon/貝割れ大根　or daikon sprous, boiled and topped with some umeboshi/梅干 pickled Japanese plum paste. 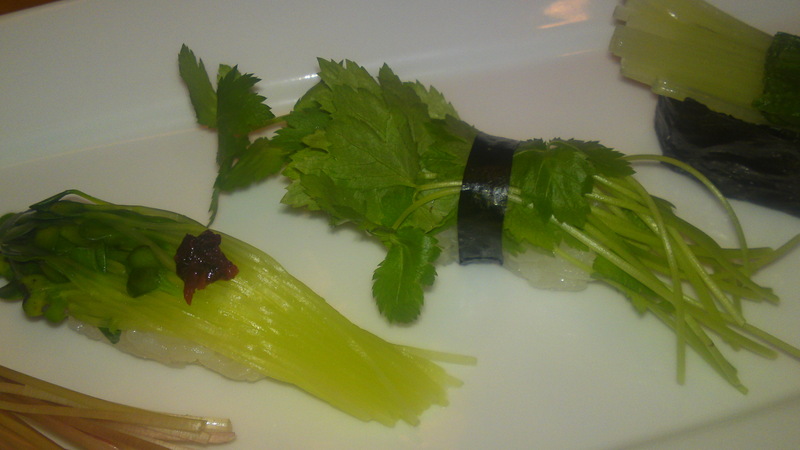 The fourth was raw mitsuba/三つ葉　or Japanese Honeywort secured with a thin band of nori/dry seaweed. 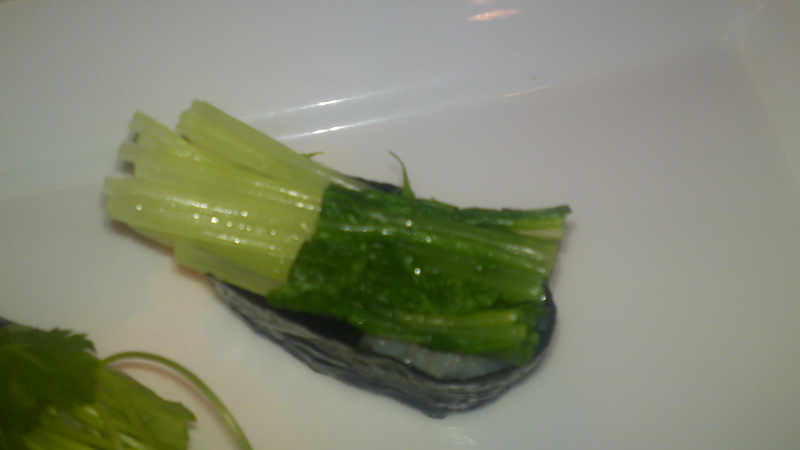 The fifth was mitsuba/三つ葉　or Japanese Honeywort again but slightly boiled and served as gunkan shushi/軍艦寿司 style. Looking forward to the next visit!